(something totally random on the side, I recently watched a video called “how to be a vacouverite”; one of the requirements is “having something from Aritzia”. I find it really funny. However, it does show how well this Vancouver local brand is doing. I personally shop there a lot, as their merchandise always fit my body type). Budget options like this one, this one in black. I personally like beige for a trench coat, so this one. Here a shorter version for my petite girls. 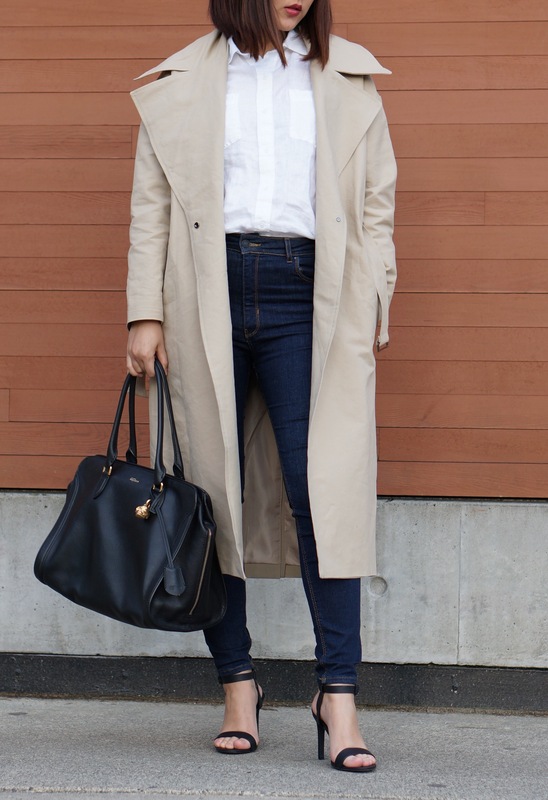 The coat I am wearing in this post is from Oak and Fort, see here. They are currently sold out of the same style, but I decide to include the link here in case they restock. A similar one is also linked here. So many choices, right? So how do you choose the right trench coat for YOU? For petite girls, I find a shorter version is more suitable, since it shows more legs. A more structured coat also fits better than a flowy one. For taller girls, I find it more flattering to wear something below the knees, so you stand out more. To have the “tall and lean” look, try something with more structured material or something oversized, like the one I have on in the picture. Love it! I think that is just perfect.